"3LA1, V-1980" by Timothy K. Perttula and Robert Z. Selden Jr. CONTEXT INFORMATION: Found in Burial 1, Burial Plot 1 (Martin 1939), in association with V-1978 ½, V-1979, and V-1981 to V-1983. DECORATION: The vessel rim has three horizontal incised panels, two of which are filled with short diagonal incised lines. There are three repeating sets of concentric trailed circles on the vessel body, each with a dimpled appliqued node at its center. Foster Trailed-Incised, var. 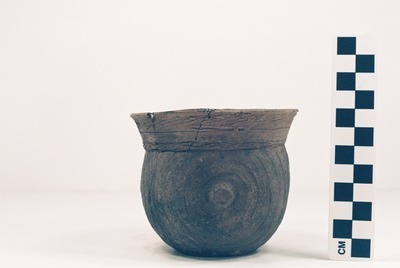 Red Lake jar (5425-679).